just my little mess: are birthday parties only for kiddos? are birthday parties only for kiddos? so...my birthday is soon approaching. And every year I get my friends together for a awesome happy hour. I thought this year I might do something a little different...I'm having a BIRTHDAY PARTY!!! With all that said I've been on a mission to find the most fav cupcakes to serve at the party! The ones on your left are really cute we bought a chocolate divine and lemon...they come in cute little packages, the frosting and fillings were great but the cake was a little dry for my taste. Now, we found another place, downtown Austin (Texas) called - Hey Cupcake - all the cupcakes were awesome! 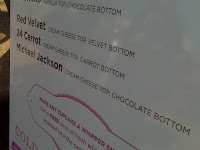 Check out the menu...I would highly recommend the 24 - carrot and / or the Michael Jackson cupcake. For the party we decided on the Michael Jackson - perfect chocolate cake with a tangy cream cheese frosting...and how super cute is this? 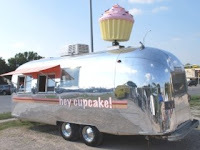 They are located in a silver trailer...it's so Austin - keep Austin wierd...and yummy!